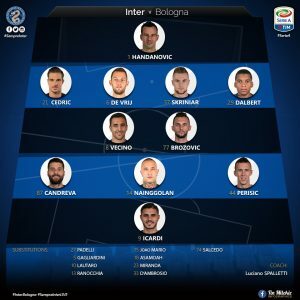 Inter played Bologna at home in another just all around poor psychological performance where Spalletti lined up in a 4-2-3-1 that consisted of Cedric who played well, Skriniar, De Vrij and Dalbert who played very well. The two in midfield consisted of Brozovic and Vecino who had a an incredibly average game. In the trio up top we saw Perisic on the left, Candreva on the right and Icardi up top. Once again, it was Inter beating themselves up from the very first minute of the game. As it happens like a ritual every year, in January and the beginning of February Inter just seems to forget how to score goals and thankfully this year they were able to build up enough of a large comfort blanket to be able to stay in third place. 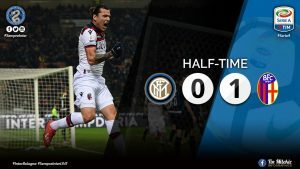 It started only thirty seconds into the game when Icardi intercepted a back pass to the Bologna goalkeeper and wired it to the right of the net and didn’t even test the keeper and from that moment I’m sure everyone in the world supporting Inter knew that this wasn’t going to be the game where they pick themselves up. 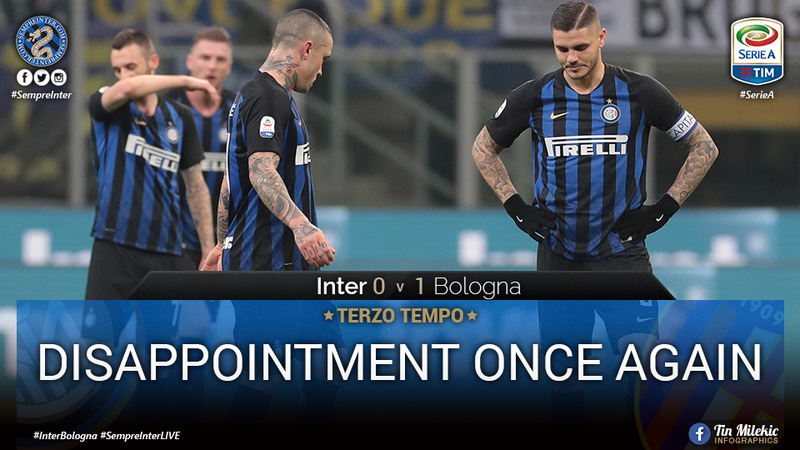 More chances came in the second half which is when Inter troubles truly started to show up. 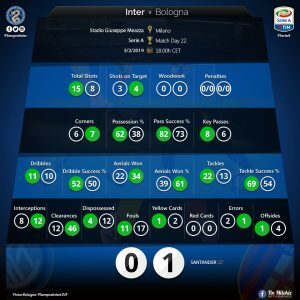 Inter was able to maintain possession of the game for nearly the entire game except for when Bologna scored on their set piece which was probably the worst possible case. As all the other bottom of the table teams in Serie A, when a weaker side scores first they’ve become incredibly talented at sitting back and absorbing an incredible amount of pressure and in the form that Inter is currently in it was almost certain that Inter weren’t going to be able to come back regardless of all the chances they generated. It’s important for the world to understand that this current slump that Inter are in has absolutely nothing to do with Spalletti and his ability to motivate the team. It’s the players and only the players who have to lift each other up in such a struggling time. What was really a shock was the entrance of Ranocchia who’s sole purpose was either to be a target man and lay it off to Icardi or Martinez or to try and pick up a cross from out wide but regardless it’s clear that this desperation was an attempt at a solution in this disappointing result sees Inter struggling incredibly.